When it comes to buying many kitchen appliances it becomes quickly apparent that the most expensive product is not necessarily the best product. But it doesn’t mean that the Black & Decker TRO480BS Toast-R-Oven 4-Slice Toaster Oven is a cheap product and performs quite well. Actually it’s a fairly controversial product because of “no good cheap goods” reviews. Large-capacity – It’s able to toast four slices of bread or two bagels split in half at one time and can be used to bake and broil as well. It’s also big enough to take on a number of functions that you would normally use your oven for but not too big to clutter up your kitchen counter. 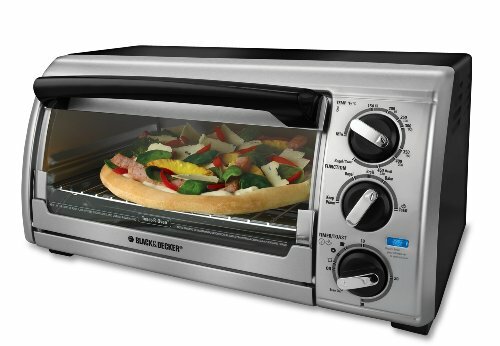 The measurements of this B&D Toast-R-Oven are 18.1 x13.3 x10.8 inches. Power – This large sized oven offers 1200 watts of power. The temperature range is adjustable and it can be heated up to 450 degrees F.
Additional Extras – This oven has a timer that can go up to 30 minutes. It has a function that can keep your food warm after it is done cooking. The crumb tray slides out for easy cleaning. It comes with a small baking pan. Although big power and timer are kind of feature, most of the complaints are against them for unsafety. What Do Owners Say About The Black & Decker TRO480BS? Heating Element – There’s no long waiting time for this toast-r-oven to get hot. Unlike your oven it heats up right away. Price – This model is moderately priced and outperformed some more expensive models. Slide-out Metal Crumb Tray – For those who worry about the material of crumb tray, Black & Decker TRO480BS is the right product. And the slide-out tray is easy to empty and clean up. Unsafe design – Some owners think that the timer position is not appropriate. The single knob should be turned clockwise to activate the timer and counter-clockwise to “Stay On”. This design makes the knob easily go slightly past the off setting and engage “Stay On”. Thermostat – Some owners also complained the thermostat is not accurate. An owner even calibrated it with an accurate temperature meter. They think the setting temperature is quite lower than actual, which is at risks of Fire hazard. In my research, some people has experience that the front exploded, sending shards of glass all over the kitchen. Some people also complained that after use of several months, baking cookies or bagels will cause flames. Noisy – Some people complained about the ticking noise that the timer makes as it counts down the time. It’s way too loud and people can ever hear it in the next room. Hot Spots – As is common in many toast-r-ovens, they tend to get hot on the sides and on the top. It’s suggested to not touch these areas and not store anything on top of the oven. It is also recommended to not leave a toast-r-oven unattended. The oven may not shut off after the timer beeps. If you buy this, make sure you put it in a place where you will be able to keep an eye on it, not in a pantry or enclosed space. It is cheap, so the problems might be tolerated if you have a limited budget.